In large bowl, beat spinach, cream cheese, 2 tablespoons of the pesto and 1 of the eggs with electric mixer on medium speed about 1 minute or until blended. Add 1/2 cup of the Parmesan cheese; beat on low speed about 1 minute or until blended. Lightly sprinkle work surface with flour. Unroll dough on surface; if using crescent dinner rolls, pinch seams to seal. Press or roll into 15x12-inch rectangle. Using pizza cutter or sharp knife, cut rectangle into 5 rows by 4 rows to make 20 (3-inch) squares. Spoon heaping tablespoonfuls spinach mixture in centers of 10 squares. Top with remaining dough squares, stretching dough to cover filling; press edges with fork to seal. Place on 1 of the cookie sheets. For easier handling, refrigerate 15 minutes. Meanwhile, in medium bowl, beat remaining 2 eggs with whisk or fork. In shallow bowl, add bread crumbs. Set aside. 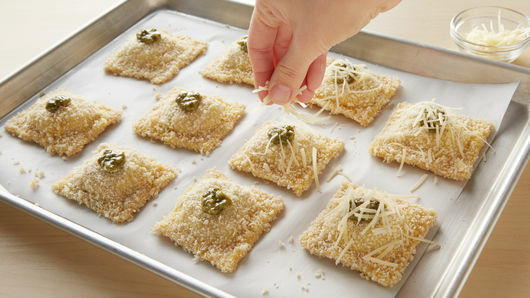 Dip each ravioli into egg, allowing excess to drip off, then into bread crumbs, coating both sides of ravioli. Place ravioli 1 inch apart on second cookie sheet. 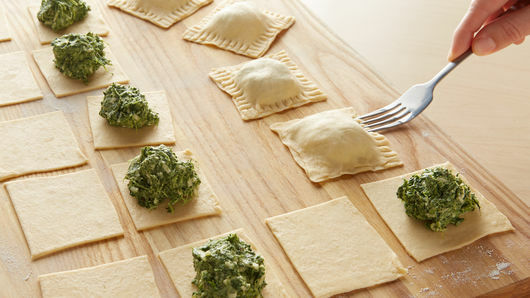 Top each ravioli with about 1/2 teaspoon of the remaining pesto; sprinkle with remaining 1/4 cup Parmesan cheese. In small microwavable bowl, cover and microwave marinara sauce 30 to 60 seconds on High or until warm. Serve ravioli with marinara sauce. For best results, work with cold dough directly from refrigerator. My mother has been entering the Pillsbury Bake-Off® Contest for as long as I can remember. I continued the tradition beginning about 15 years ago. In fact, when I call to check on my almost 85-year old mom each day, we greet one another by saying "Good Mornin', Pillsbury!" So here I go again.My family loves anything with spinach. Spinach on pizza, in eggs, on appetizer breads—just about anything with spinach, we think, takes it up a notch. A favorite appetizer of ours is a bread loaf carved out in the center and filled with spinach and melted cheeses. We serve it with a tomato sauce dip. So, I thought, why not something with a similar taste? Instead of the Pillsbury French bread, the Crescent Dough sheets would allow me free rein creatively, so with half dozen crescent dough cans in hand, I went to work. I finally settled on ravioli, but how and what to do with it? It had to be unusual, easy to do and tasty. 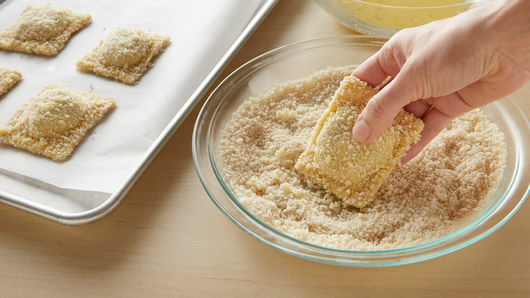 Panko bread crumbs are another family favorite because of the crunchy texture. I usually pan fry chicken or fish with panko, why not dough? 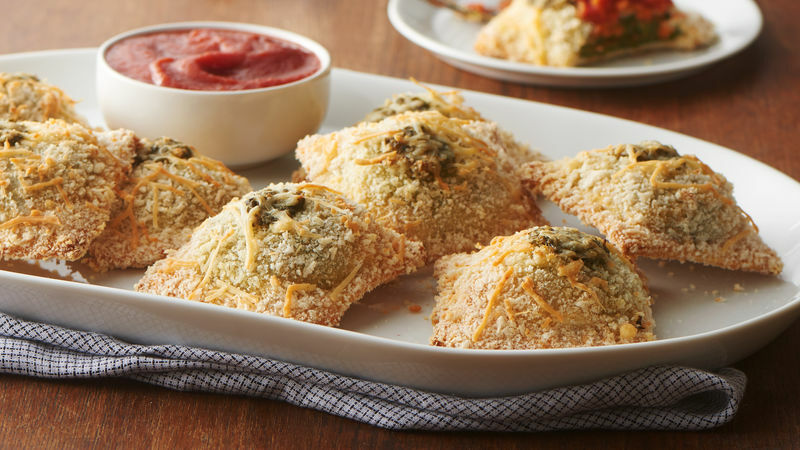 Baking was the healthier, more interesting option and I decided, that was it: toasted ravioli with a spinach and cheese filling, pesto to give it zing and marinara dipping sauce to give it a nice finish, yum! The Pillsbury Bake-Off® Contest period is a really exciting and fun time in our family because everyone tries the creations and gives their opinions. The main taste tester, my foodie husband, gave it a thumbs up! So, it's one more for the Pillsbury Bake-Off® Contest, and the tradition carries on.